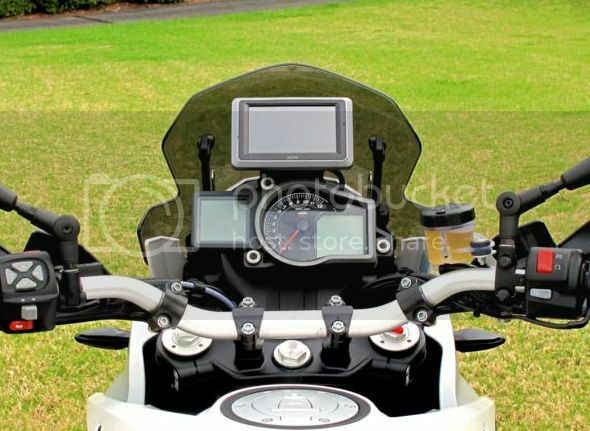 Does anybody know if the Garmin mounting bracket fixes to the KTM sat nav mount? I thought the same about the Garmin but being a tight Cumbrian, wanted reassurance it will fit before parting with hard earned shekels lol. I was going to use a handlebar bolt ram fitting but fix it sideways on to the Powerparts mounting points on top of the dash but would mean running a longer bolt through? Good to know, i was going to get one but not bother now, does it come with a brace bracket? It's does yes but it still wobbles a bit. Not like it's got shingles but more than I'd like lol. I brought the KTM bracket that goes above the instruments then a bycycle waterproof pouch that comes with sponge inside and a Garmin car GPS and it works great. I did bend the bracket towards the rider a bit as sun glare got it a bit and when you are riding it is easy to see as it is right in your view,you don't have to look down. I also brought the Garmin with trip planner feature which you can take whatever road you want and i also like that idea. With the bycycle pouch you can still operate the screen with gloves cause the GPS is right up against the clear plastic but as you know gloves hinder it a bit,also bluetooth is handy if you have helmet comms for phone calls,i usually only use phone when goin through towns at legal speeds. So far, this is the only above dash mount Ive found that works, is rigid and does not vibrate. Its the SW Motech mount. Ive used it with a lot of offroad and its the only one that works. Simple effective and works as all the others should. Im using it with my 660. 1st pic is mine, the other two are SW pics. What screen are you running as i thought i may have clearance problems if i tried to put a screen on but yours looks great. Its the standard screen on my R.
Pictured in the low position. No dramas with clearance on any of the screens Ive seen. I also have a standard S screen and its fine too. I actually found my PP mount much better when the screws were tighten properly too lol. I dont think its pricey when compared to whats out there. Its well designed, its simple and works under the worst conditions. I fitted the Touratech mount designed for the 1190. I had to grind some of the bracket on the right side to clear the windscreen locking lever but it works great. No vibration and it does not obstruct anything else.